Salvation And Survival: The Holy Spirit: We Can Have More! The Holy Spirit: We Can Have More! As you have likely noticed over the last year, a lot of my posts have centered around the Holy Spirit. And I believe this is because there is so much more of Him that God wants us to experience. And to that point, I wrote a blog post in August, 2015, sharing my opinion on the difference between water baptism and the Baptism of the Holy Spirit. What a difference two years can make! Although I do not necessarily disagree with what I wrote back then, I have now experienced a fuller encounter with the Spirit and I must amend my opinion. As I continue growing and maturing in my faith, God reveals more, and I'd like to share that knowledge with you. I would venture that a majority of Christians would agree with me when I say that we receive the indwelling of the Holy Spirit when we accept Jesus Christ as our Savior. It is accepted that water baptism is evidence of our repentance, and we are walking in a new relationship with God, the Father, and Jesus, our Lord. In fact, according to Strong's Concordance, water baptism by a Christian believer is "witnessing to their identification with Jesus in death, burial, and resurrection"; we die with Christ, and rise with Him. When we get baptized in the Name of Jesus, we become closely bound and associated with the One into whose Name we are baptized. Yet I am convinced that we do not need to be water baptized to be saved. Yes, it is a public act that proclaims to both the physical world and the spiritual world that we have faith in Jesus and His teachings -- that we are learning to be like Jesus by following His example of submission, service, and sacrifice in response to faith in Him. But, now, let me present a different look at salvation without water baptism. There is the account in John 13:8-11 of a conversation between Jesus and Peter. Jesus is about to wash Peter's feet, but Peter protests. Jesus tells him, "Unless I wash you, you have no part with Me". Peter then tells Jesus that he wants to be washed completely -- "not only my feet, but my hands and my head", which indicates full body immersion. Jesus responds, "Anyone who has bathed needs only to wash his feet, and is completely clean. And you [My Disciples] are clean...". What does Jesus mean by that word "bathed" and how does it render the Disciples clean? This becomes clear in John 15:3, when Jesus tells His Disciples, "You are already clean because of the word which I have given you [the teachings which I have discussed with you]". They were bathed in the Word and therefore saved by Faith in Him [and His teachings]. Do not get me wrong! 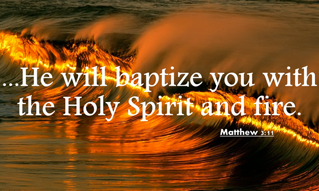 There is nothing wrong with being baptized in water! It honors your commitment to your faith as a follower of Christ. But water baptism itself, does not save. "For it is by grace we have been saved by faith" (Ephesians 2:8). I'd like to share the writing of the late Jay Guin on his interpretation of what Jesus was expressing to Peter in this passage: "You are utterly clean, by grace, because you’ve accepted My teaching and so have faith. But neither My teaching nor your cleansing will be complete until you learn one last lesson, the lesson of humble service. I’ll teach this lesson by washing your feet, but I’ll complete the lesson by dying for you. But I know already that you’ll learn that lesson well". Now, let me continue with my thoughts on the Baptism of the Holy Spirit. Ephesians 1:13 tells us that "having also believed, you were sealed in Him with the Holy Spirit of promise". This indwelling of the Spirit allows Jesus to come into our hearts and reside there with us; in effect, giving us a new heart and a new [indwelling] spirit, just as God proclaimed in Ezekiel 36:26. We are a new creation, and we no longer have to be subject to our sinful flesh and human nature. But in order to overcome the temptations of this world and the fiery darts of the devil, we must receive the power of the Holy Spirit -- and actually we should be asking for that power, which comes to us by another form of baptism ... the baptism of the Holy Spirit. Luke 11:13 tells us, "If you, then, being evil [that is, sinful by nature], know how to give good gifts to your children, how much more will your heavenly Father give the Holy Spirit to those who ask and continue to ask Him!” So, the obvious question is if this is the indwelling of the Spirit that accompanies our declaration of faith in Jesus, then why is Jesus telling us that the Father will give us the Holy Spirit if we ask Him? This must be a greater manifestation of the Spirit. And, in truth, Jesus tells His Disciples right before His ascension, "But you will receive power and ability when the Holy Spirit comes upon you; and you will be My witnesses [to tell people about Me] both in Jerusalem and in all Judea, and Samaria, and even to the ends of the earth.” It is clear to me that what happens to them in the upper room at Pentecost is the bestowal of that power and ability -- an empowerment for service to the Kingdom of God and to represent Him and do His works. One of the best illustrations of the difference between the indwelling of the Holy Spirit and the Baptism of the Holy Spirit was presented in an article on the Christian Broadcasting Network website ... "if we drank water from a glass, then the water would be inside us. However, if we went to the beach and stepped into the ocean, then we would be in the water. We receive, as it were, a drink of the Holy Spirit when we are saved, but when we are baptized in the Spirit, it is as if that initial drink becomes an ocean that completely surrounds us". The indwelling of the Spirit gives us the opportunity to live our lives [set apart to God and in righteousness], as Jesus did. The Baptism of the Spirit gives us the ability and the power to do the ministry of Jesus, including miracles and healings. Think about it... the Great Commission, as stated in Mark 16, says, Go into all the world and preach the gospel [of the Kingdom] to all creation. He who has believed [in Me] and has been baptized will be saved [from the penalty of God’s wrath and judgment]; but he who has not believed will be condemned. These signs will accompany those who have believed: in My name they will cast out demons, they will speak in new tongues they will pick up serpents, and if they drink anything deadly, it will not hurt them; they will lay hands on the sick, and they will get well.” It is my opinion that the baptism of these believers is the baptism by fire of the Holy Spirit -- not water baptism! Jesus knew they would not be able to do these signs (miracles) under their own power. So that's why He told them to go to Jerusalem and wait for the promised [supernatural] power of the Holy Spirit, and they would be able to accomplish their commission. The "promise" of the Holy Spirit is not merely His presence in us, but it is a promise of the power that accompanies Him! Is it possible to spread the Gospel of the Kingdom and make Disciples without the power that comes from the Baptism of the Holy Spirit? I believe it is, but it amounts to trying to train people to undertake a supernatural assignment with their limited human power. The fruit that is borne will be less profitable for the Kingdom of God. 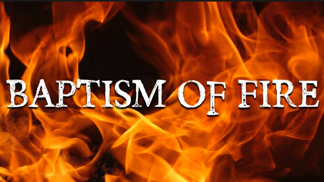 Just like the baptism in the Name of Jesus, we become eternally associated with and bound to the Holy Spirit when we are baptized with His fire. When we are baptized by immersion in water, we do so in repentance of our sins, recognition of our new identity in Christ, and a desire to live in obedience to God. But it takes receiving the baptism of the Holy Spirit to enable us to walk in a higher calling to God. And the Disciples are our example. They were bathed in the Word and had faith in Jesus, which caused Jesus to pronounce them "clean". And there are numerous references to "cleansing" being related to salvation, such as 1 John 1:9, If we confess our sins, He is faithful and righteous to forgive us our sins and to cleanse us from all unrighteousness. And, yes, it is a fact that the Disciples were able to heal the sick and cast out demons before they received the Baptism of the Holy Spirit, but it wasn't until the fire of the Holy Spirit descended upon them at Pentecost that they received a fuller measure of supernatural, heavenly power to carry out the Commission Jesus had given them. I know that many Christians will not see eye-to-eye with me on this matter. It is a difficult concept to understand, and sadly, I do not believe the modern Church has attempted to seek a deeper knowledge. They do not understand that the Bible clearly states that Paul taught that one received this greater power by the laying on of hands... Acts 8:17, Then Peter and John laid their hands on them [one by one], and they received the Holy Spirit; 2 Timothy 1:6, That is why I remind you to fan into flame the gracious gift of God, [that inner fire—the special endowment] which is in you through the laying on of my hands...; Acts 19:1-6, It happened that while Apollos was in Corinth, Paul went through the upper [inland] districts and came down to Ephesus, and found some disciples. He asked them, “Did you receive the Holy Spirit when you believed [in Jesus as the Christ]?” And they said, “No, we have not even heard that there is a Holy Spirit.” And he asked, “Into what then were you baptized?” They said, “Into John’s baptism.” Paul said, “John performed a baptism of repentance, continually telling the people to believe in Him who was coming after him, that is, [to confidently accept and joyfully believe] in Jesus [the Messiah and Savior].” After hearing this, they were baptized [again, this time] in the name of the Lord Jesus. And when Paul laid his hands on them, the Holy Spirit came on them, and they began speaking in [unknown] tongues (languages) and prophesying. This speaks of the water baptism in response to faith in Jesus, [rather than the baptism of repentance that signified John the Baptist's baptism], followed by the Baptism of the Holy Spirit, received by the laying on of hands; and the gift of tongues clearly being a sign of this baptism into power and ability. There is so much more that I could discuss -- that all the gifts of the Holy Spirit are available to each one of us because if the Holy Spirit indwells us, He brings His gifts with Him, and, as 1 Corinthians 12:11 tells us, All these [gifts] are empowered by one and the same Spirit, who apportions to each one individually as He wills. ALL the gifts are available to ALL believers! The Bible tells us that not all are apostles, nor prophets, nor teachers; and not all perform miracles, or healing, or speak in tongues. But does this mean we are not able to do these things? The Bible also tells us to "earnestly desire the higher gifts". Seek after them; ask for them! Luke 11:13, If ye then, being evil, know how to give good gifts unto your children: how much more shall [your] heavenly Father give the Holy Spirit to them that ask Him? The Baptism of the Holy Spirit requires a deep study of the Word, and is not without controversy and disagreement amongst the Body of Christ. But it is an essential part of the Bible and worthy of our time and consideration. I hope you will earnestly seek God's heart on this matter. Acts 8:15-16 They [Peter and John] came down and prayed for them that they might receive the Holy Spirit for He had not yet fallen on any of them; they had simply been baptized in the name of the Lord Jesus [as His possession].